New Delhi/Mumbai: India’s second largest mobile phone company by subscribers, Reliance Communication Ltd, or RCom, has been accused by government-appointed auditors of under-reporting revenue to save on licence fees and inflating numbers to the stock exchanges. The Anil Ambani-controlled company rejected the report’s conclusions, calling the auditor’s comments biased. Jaipur-based audit firm Parakh and Co., which was asked to carry out a special audit of RCom by the department of telecommunications (DoT), has informed the ministry about its findings. The company sought to avoid paying around Rs316 crore in licence and spectrum fees in the two years ended 31 March 2008, the auditor said. The government said it was yet to examine the results of the inquiry. “The report on the special audit being carried out has been received. The report is at present sealed and will be opened and examined in good time," said a senior DoT official on condition of anonymity as he’s not authorized to speak to the media. An official close to the auditing firm confirmed that the ministry was yet to call on Parakh to discuss the report that was submitted on Thursday and hence, was unwilling to discuss details. The “special auditor has not discussed the report or the findings with RCom nor provided a report copy", a company spokesman said in an emailed response to Mint and the “auditors’ alleged comments are biased and appear instigated by corporate rivals. (The) premature leakage of the confidential report" showed the “auditors’ prejudice/bias". RCom said no communication had been received from DoT on this and “all revenues for FY07 (2006-07) and FY08 (2007-08) were correctly reported in RCom’s audited accounts". The latest discovery has come at a time when the Indian telecom sector—with 494 million subscribers—is in the middle of an intensifying tariff war and RCom, the latest entrant in this price game, lowered call charges to 50 paise a minute. RCom has 84.11 million subscribers, second to Bharti Airtel Ltd’s 107 million. RCom went under the DoT scanner after a July 2008 Kotak Securities Ltd report pointed to discrepancies between revenue reported to the stock exchanges and the Telecom Regulatory Authority of India (Trai). DoT later expanded the audits to cover other phone firms such as Bharti Airtel, Vodafone Essar Ltd, Idea Cellular Ltd and Tata Teleservices Ltd after Trai found discrepancies. All the reviews pertain to fiscal 2007 and 2008. The other reports are expected to be submitted to DoT by the end of this year. “The amount is just above 10% of their topline (revenue) but their brand name has taken a serious hit," said an analyst with a Mumbai-based brokerage who declined to be named as he is not authorized to speak to the media. “This audit was carried out for years when they were not really under much pressure." Now with the new operators coming in, the competition has intensified, he added. RCom’s shares fell 0.62% to Rs247.80 on the Bombay Stock Exchange on Monday, lagging behind the bellwether index, the Sensex, which advanced 2.31% to close at 17,026.87 points. The auditors said RCom’s actual wireless revenue was Rs12,298 crore as against Rs15,213 crore reported to the shareholders, the report says. According to the audit report, RCom has violated other Trai and DoT rules. The auditors have alleged that the firm accounted revenue of Rs617 crore in two different accounting years. Elsewhere, a sum of Rs379 crore came from selling expired pre-paid cards to two firms—Macronet Pvt. Ltd and Inference Systems Ltd, the last being a Reliance-Anil Dhirubhai Ambani Group company. A key reason for the Rs2,915 crore difference in revenues reported to Trai and to the stock exchanges is the difference in wireless revenue, the report said. According to DoT officials, India’s telecom operators pay a percentage of their adjusted gross revenue, or AGR, as revenue share to the government. 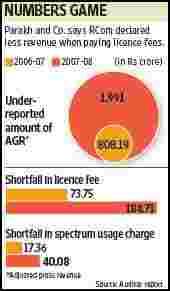 This revenue share consists of 2-6% of AGR as spectrum fee and up to 10% of AGR as licence fee. AGR, according to its present definition, includes all revenues that accrue to the licensed firm directly, that is, it does not include revenue from service tax and interconnection charges. The definition is being contested by telecom operators who say that revenue not coming from the wireless business should not contribute to AGR. 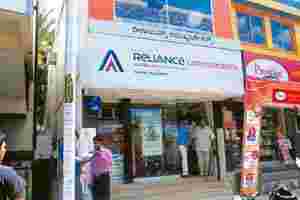 RCom, in its response, said that “revenues (were) correctly booked from securitisation of bad debts received from RIL in 2005... (as well as) sale of prepaid cards, in line with industry practice. (The) alleged comments of the special auditor do not reflect any under-reporting of revenue share/license fees" and that it was “in full compliance of license terms and conditions". The auditors have also alleged that there had been cross booking of revenues between RCom and its subsidiary Reliance Communications Infrastructure Ltd (RCIL). This includes booking revenue accruing from one licence under another one that attracts a lower fee. The report will be opened and examined by a four-member committee of DoT headed by the member, finance, of the telecom commission, said another senior DoT official, who also declined being named. As per the Kotak report, which first pointed out the discrepancies, the revenue deficit was Rs197 crore in 2006-07 and Rs2,563 crore in 2007-08. The auditors say that for the 2007 fiscal year, the under-reported revenue amounted to Rs808 crore and Rs1,991 crore in the next year. This under-reporting led to a loss of Rs258.46 crore in licence fees and Rs57 crore in spectrum usage charges, the audit report said.